Project AWARE goals shared with Cardiff University! Home/Cardiff University, News, Open Water Course/Project AWARE goals shared with Cardiff University! 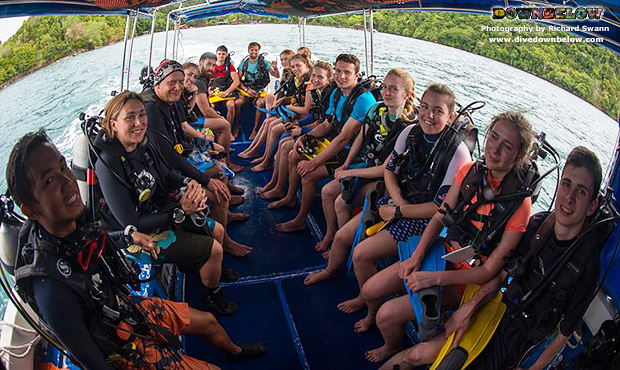 For the second year in a row, Downbelow Marine and Wildlife Adventures and Cardiff University have shared the same Project AWARE goals of marine conservation! This June, a group of 15 participants (includes 2 University staff) camp for 12 nights at our premier PADI 5 Star IDC Dive Centre in the TAR marine park. For the 12 who are not yet certified divers, they will be taught the PADI Open Water Diver course by our team of PADI Instructors before they continue on to our buoyancy clinic to fine tune their buoyancy. Peak performance buoyancy is essential to the students underwater tasks to conduct their ecological surveys: coral identification, fish sizing and mapping. Resident Platinum PADI Course Director Richard Swann will oversee the students progress and ensure they receive plenty of practise collecting data and also receive a unique education on marine conservation. Because, after all, these surveys are recorded for the purposes of protecting and preserving marine life and its habitat! Our Sabah Travel Centre have years of expertise in arranging specialised educational programs, such as Cardiff University’s annual tropical ecology field trip – contact our advisors for more information! By Joanne Swann|2015-06-22T14:30:35+08:00June 26th, 2015|Cardiff University, News, Open Water Course|Comments Off on Project AWARE goals shared with Cardiff University!